Recently renovated Fall 2018 7th Floor Unit in the Harbour Tower with extraordinary Gulf and Bay views from your large screened-in balcony. 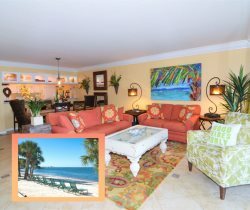 This condo in Sanibel Harbour, Florida is decorated in Blues, Yellows, and Greens; boasting sunshine inside and outside day or night. All new furniture, updated kitchen and bathroom, along with an HD TV in the living room. The master bedroom has a King bed and the guest bedroom has 2 twin beds. Sofa Sleeper in living room. You won’t find other Sanibel Harbour accommodations this cozy and comfortable. You may have found this rental on HomeAway 4363819, HA ID 4363819, VRBO 4363819ha or Vacation Rentals 4363819. The few times I have needed to speak with them, they were nice, friendly and very willing to help. My wife and I enjoy the laid back and generally quiet atmosphere which allows us to fully relax and forget about work for awhile. We enjoy meeting and speaking with tenants and guests at the pool who are mostly retired persons. The unit in which we stayed was very recently remodeled and was very nice. I plan to book next years vacation at the same place very soon! Thanks for a great week. The property was great. Especially the view. The team and staff were wonderful and things were clean. The pool was nice. The beach isnt that great tho. Thats the only drawback. They were very helpful in recommending places to eat. They also were very happy to print out my boarding pass for me. I have stayed here several times and will keep coming back to Resort Harbour Properties. The location is so perfect and peaceful, and the views from your balcony just take your breath away! Difficult to find recycle bins.Property and unit was very nice. Had a great week. We needed more kitchen garbage bags and Katie brought them right to us, and with a smile she was so nice. The unit was very clean,and everything was neat and in its place. The unit appeared to have been updated as it had very nice furniture and a flat screen tv in the living room. We watched the sunset every evening from the balcony and each one was spectacular. The water view from the balcony is beautiful, you can see boats going by and hear the waves. We saw a pod of 3 dolphins and a couple of them were just little babies, so neat to see. We drove to Sanibel (30 min drive)and enjoyed the clear blue water and beautiful beach there (being an umbrella for the sun), the condo is close to many stores too. Thoroughly enjoyed our stay, it was relaxing, fun and we will return. I have to also mention the staff as we spoke with several of them before and after booking and they are awesome! Katie, Kelly and Cara were wonderful. When I called them they took care of my needs inmediately. Beautiful spot! Would stay there again. Our stay was excellent, from the staff, location and the condo. Great time. The condo and the view from the 7th floor was wonderful. We enjoyed watching the boats go by. It was a very relaxing vacation. Your team is very good and helpful and we will certainly recommend your property.